The input impedance of this module is very high, if U1 is OP07 it is in mega ohms, use CA3140 or LF356 fet input opamps to get 1 tera ohm input impedance, but for high gains OP07 is better as it is ultra low offset, this is a good amplifier for sensor outputs, as in a DC Circuit. 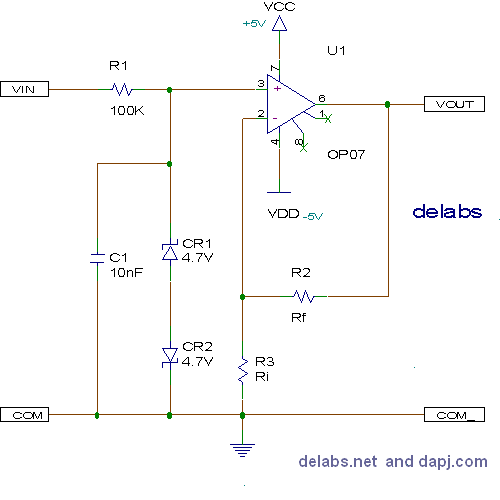 The zener diodes protect the opamp inputs, R1 limits current during high voltage inputs and R1 and C1 form a filter to remove ac components C1 should be a plastic type as ceramic and electrolytic caps are leaky. A large C1 will slow the response time, the sum of Ri + Rf should be greater than 5k so that output is not loaded. also do not connect output to voltages more than vcc/vdd it will blow Opamp.